The house is in a quiete area, in residence with swimming-pool. Private garden. 1,5 km from Lake Garda. 5 Km from Exit A4 (Desenzano del Garda). Amazing view onto the Lake and unforgettable Panorama. A sunny quiet place with a big Olivsgarden around. The vacation flat also comes with a shared swimming pool with deck chairs and shower, and private car parking space. In Gardoncino (Manerba del Garda), apartment on first floor, big balcony with beautiful view on the lake. Two bedrooms. 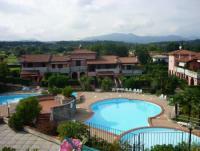 Nice apartment in Manerba del Garda - Pieve, in quiet residence with swimming-pool. 950 meters from the beach. in a quiet setting, each with balcony or terrace and lake view, ideal starting point for biking and hiking tours and for trail rides.